I’ve spent the last few days in Nashville, Tennessee attending a technology conference with my dad. When he asked me to come with him, I wasn’t too excited about sitting in meetings with tech nerds all day (Who am I kidding? I’m a tech nerd myself) but I jumped at the chance to spend time with my dad and knew I could sneak in a few good restaurants during our downtime. After the last session on Thursday evening, we bolted out of the conference hotel and headed to Loveless Cafe, a Nashville institution for more than 60 years. 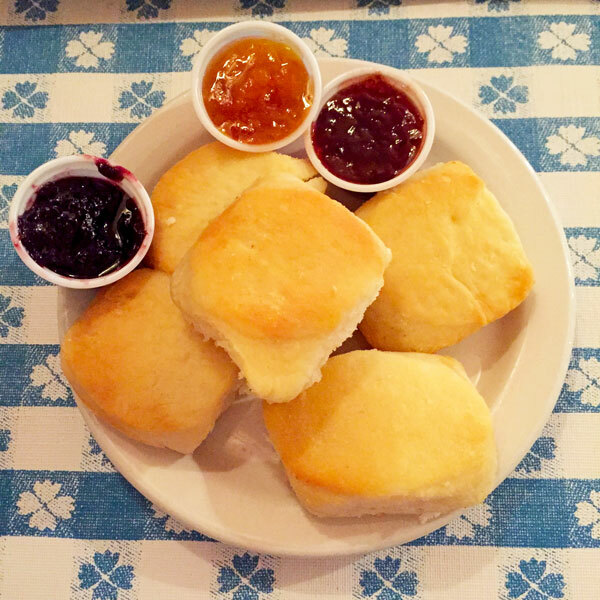 Loveless Cafe is known for southern staples such as country ham, biscuits, fried chicken, and bbq pulled pork. The cafe started in 1951 when original owners Lon and Annie Loveless began serving food out the front door of their home to the travelers passing by on Highway 100. 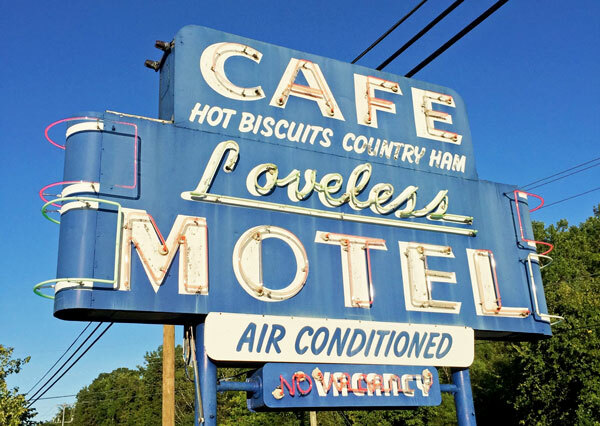 The biscuits and preserves became known and travelers began making Loveless Cafe a planned stop on their trip, prompting the addition of 15 motel rooms and the iconic sign. 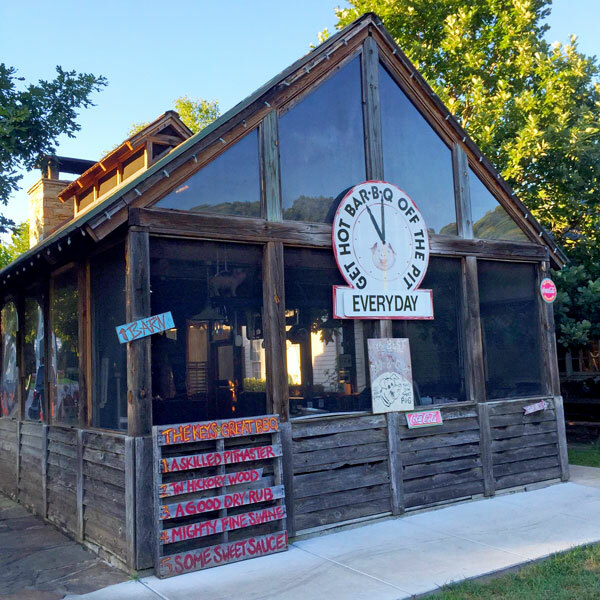 Loveless Cafe has endured many different owners and changes over the years. Today it is a full-fledged campus, brimming with southern hospitality and serving true southern comfort food indigenous to central Tennessee. 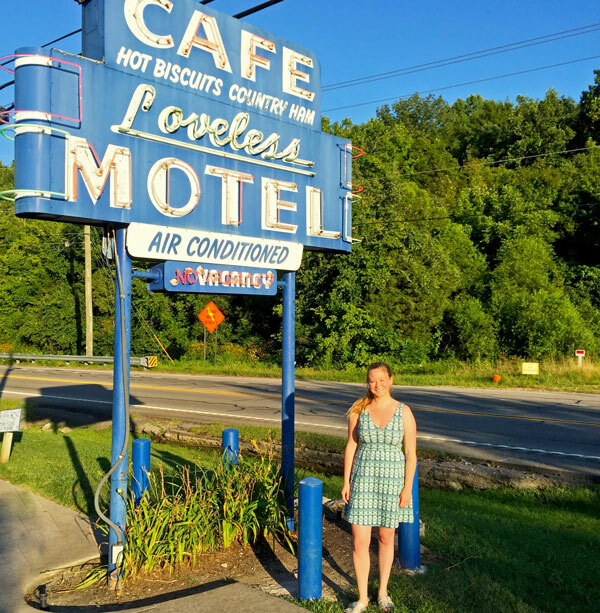 I don’t think you’ve actually visited Loveless Cafe until you take a photo in front of the famous sign. We did our best to get a selfie but the sun was so bright that this was the best we could do. 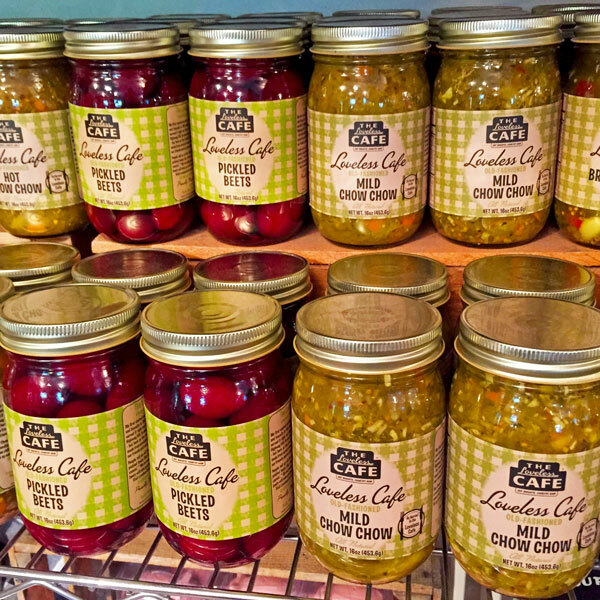 The country market also sells a variety of preserves and jars of pickled items made on-site. I didn’t purchase any of these but I wish I could have grabbed a jar of peach preserves to take home. You can also check out the apparel shop, the barn, and the smokehouse. I especially enjoyed looking at bbq and indoor/outdoor kitchen set up. 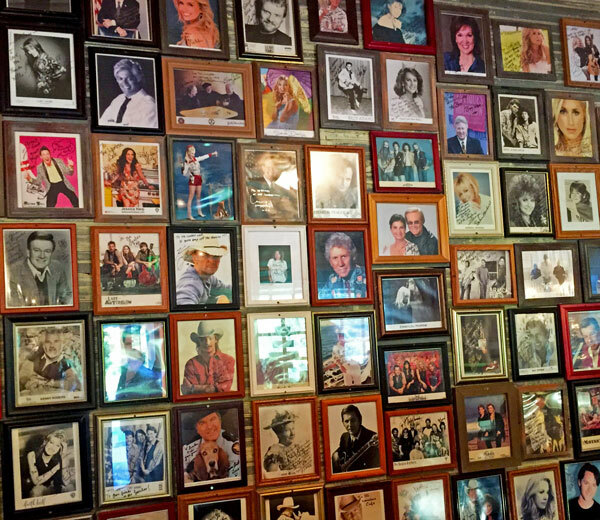 Step inside the cafe and it’s hard not to be impressed by the wall of fame. The Loveless Cafe has been a hot spot for celebrities for the last 60 years. 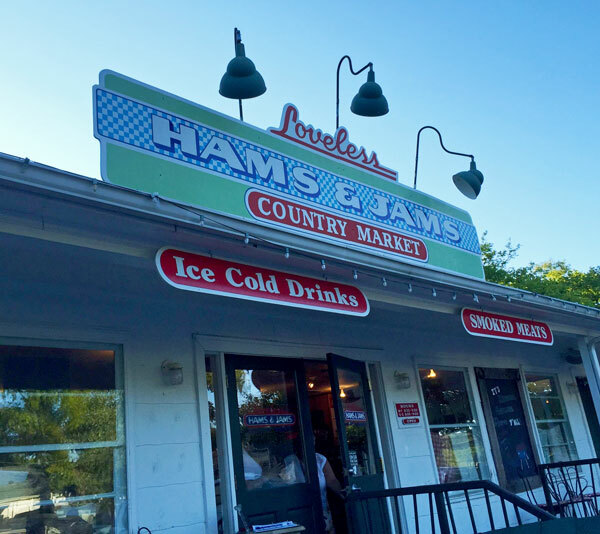 You’ll find everyone from Elvis to today’s country music superstars have stopped by to enjoy the biscuits and country ham. Once we made it to our table, a platter of the famed biscuits (Annie’s original secret biscuit recipe remains unchanged to this day) and preserves arrived nearly immediately. I’m a bit of a biscuit fanatic and I am happy to say that these lived up to my expectations. Served warm, the biscuits are fluffy, tender, and full of butter richness. The homemade preserves (raspberry, peach, and strawberry) serve as the perfect complement and add flavor and a hint of sweetness. 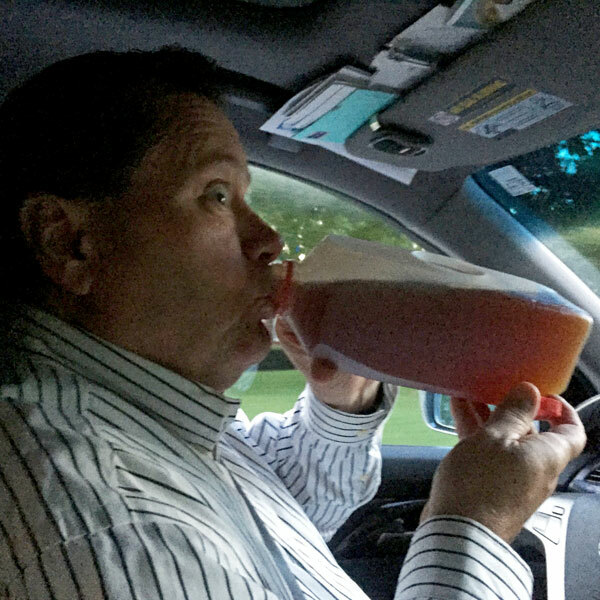 The peach preserves were my favorite. It was difficult but I had to stop myself from eating the entire plate and ruining my dinner. Be sure to save a biscuit to eat with your meal (I’ll tell you why in a minute). The menu is lengthy and, having trouble deciding, I thought I was going to have to order two entrees in order to try everything (I’ve been known to do this). Luckily, I finally saw the sampler platter listed at the bottom of the page and my problems were solved. 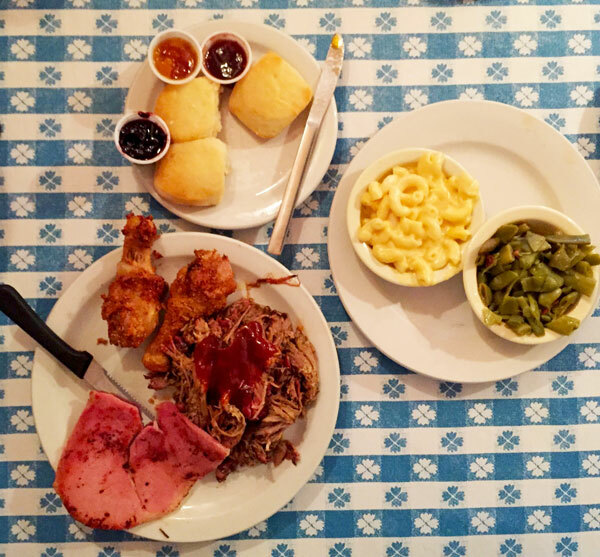 I chose the three items the Loveless Cafe is known for – fried chicken, bbq pulled pork, and country ham – along with the mac and cheese and slow cooked southern-style green beans on the side. This is southern food at its best. The bbq sauce was tangy with a bit of sweetness and, after I took a few bites, I was pleasantly surprised to find a hoecake hiding under the pulled pork. Just like it should be, the fried chicken was crisp and crunchy on the outside with a moist and juicy inside. Flavorful and delicious, the side dishes held their own and competed with the meats to earn their spot on the platter. If you were disciplined enough to save a biscuit to enjoy with your meal, follow my lead and create the ultimate sweet-savory sandwich. Just tuck a slice of country ham inside a biscuit slathered with peach preserves and enjoy. I always appreciate a restaurant that offers a dessert sampler platter. 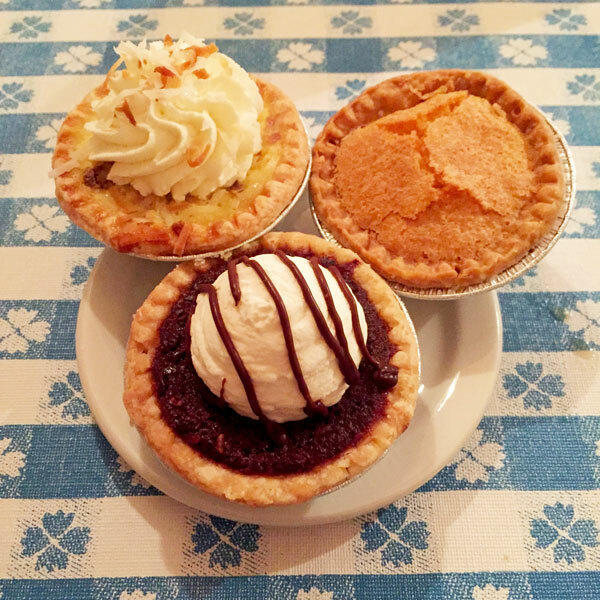 Loveless is known for their pie and banana pudding. Not a huge banana fan myself, I decided to go with three different flavors of pie — coconut cream, chess, and fudge silk. The fudge silk was my favorite of the three and surprisingly balanced, not cloyingly sweet or too rich. 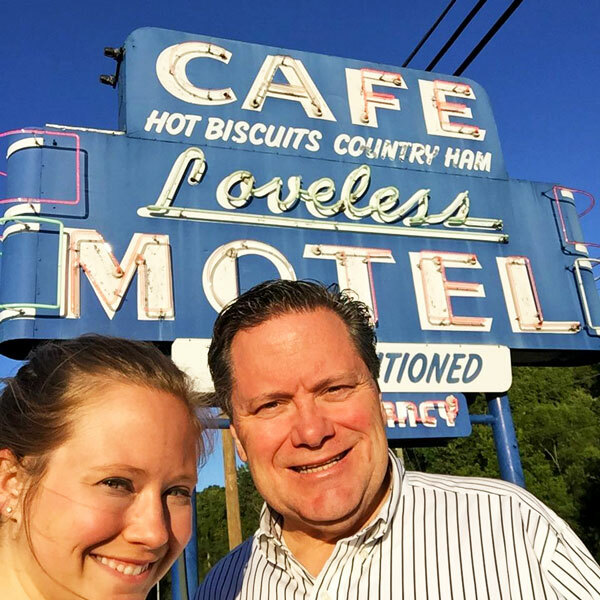 If you’re in Nashville or passing though, make time to stop at Loveless Cafe to enjoy comfort food and a healthy dose of southern hospitality. Dear, THTB, I loved reading about this place in Nashville! I love watching the Food Network, and my favorite show is "Diners, Drive-Ins And Dives". The main reason is that they seek out places like this and showcase them so the country can see there are quality restaurants everywhere that do not get the proper credit they deserve. It is a must stop for me the next time I'm in Nashville! Thanks! TO. PS: I'm sure this place has all ready been featured on the previously mentioned program!